…but we can and should love all of our clothes, regardless of whether or not we made them. To explore this implementation of my “Fit to Flatter” ideas in a broader context, I started a series on my own blog called “Fashion Fridays”. I thought you might like to share in an excerpt! Let’s start with the basics. The clothing, lighting, makeup, and conditions are the same. I’m smiling in both pictures. My underlying body shape is a proportional one, with a very straight waist and a long torso/short legs for my height. If you’re not comfortable in it, you won’t look good in it. Your happy spot, clothing wise, is a very personal one. I’m not out to give you some crazy, restrictive rules you need follow slavishly. I’m here to help you figure out how clothing can make you happy. If something doesn’t feel good? Don’t wear it! So what’s going on with these outfits? Contrast that with the visual impressions I’m giving in the left-hand picture: My contrast-colored tank, now visible in curvy strips and at my hips, shortens my torso and paints a curvier waist. My legs are lengthened by my long, plain pants. My deep V-neckline brings my bust visually up close to my head. 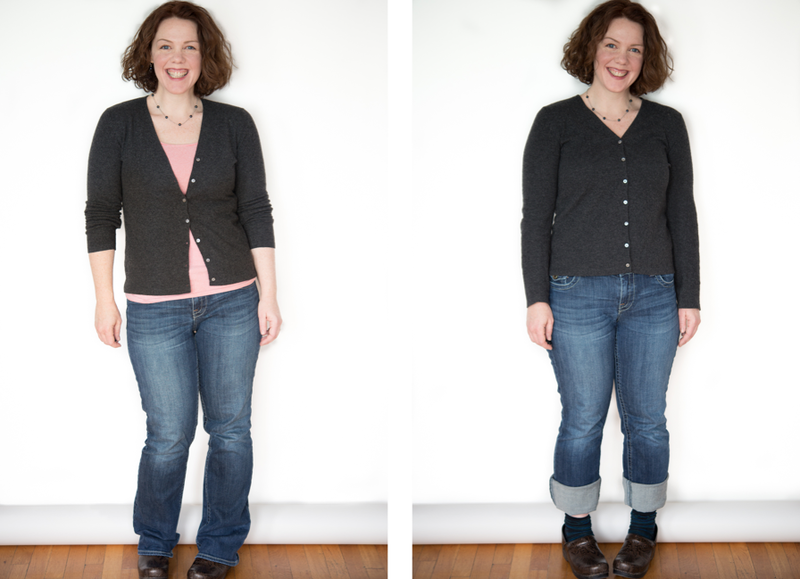 There are lots of reasons I’m more comfortable in the clothing on the left, and other people perceive me differently as a result. Again–I’m not saying one way is “right” and the other “wrong” for everyone–far from it! But for me personally, one outfit makes me feel beautiful, and the other dumpy. And that shows! 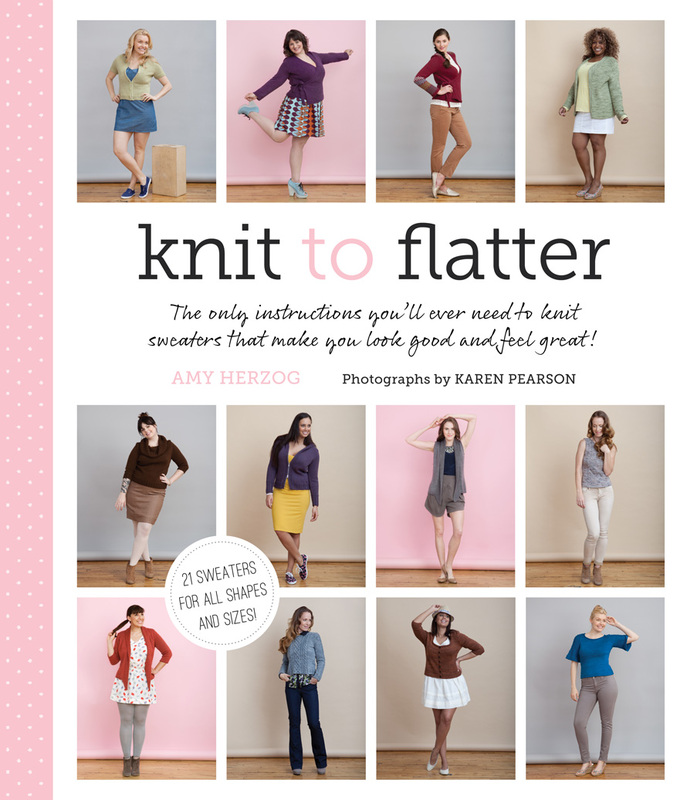 Amy Herzog is the author of Knit to Flatter: The only instructions you’ll ever need to knit sweaters that make you look good and feel great! . She teach classes around the US and online about creating sweaters that are tailored, clean, and fit perfectly into every wardrobe. You can find a full list of her designs on her designs page and in her Ravelry designer profile. For more information, visit her blog.